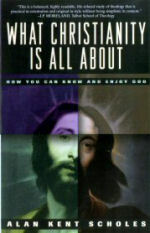 General Topics & Doctrine | What Christianity is All About: How You Can Know and Enjoy God | Watchman Fellowship, Inc. Contents: 222 pages, notes, and index. WOULD YOU LIKE TO ENJOY A CLOSER RELATIONSHIP WITH GOD? The more you discover about God, the more you can truly know and enjoy Him. Join Alan K. Scholes in an easy- to-read yet intensive study of the basic doctrines of the evangelical faith. Build a deeper relationship with God through an in-depth look at who He is, who we are, and how we can relate to Him. Read true life examples, both tragic and triumphant, that will help you defend your faith to the world. Find a better understanding of your faith and a renewed passion for Christ through doctrinal information, personal stories, questions, and suggested readings. Ideal for students, lay people, and those working with new believers. Includes questions for personal reflection and group discussion.